If you’re a homeowner or are in the market for a new home, you may have heard about thermal imaging scans of homes using an infrared camera. This is because some home inspectors now use thermal imaging in home inspections. Infrared thermal imaging technology reads the thermal energy emitted from an object and identifies differences in heat not visible to the human eye. These variations in temperature help home inspectors gauge what kinds of issues may be happening behind your house’s walls, floor, or ceiling. Since thermal imaging in home inspections is a relatively new practice, it’s important to do your research and find a home inspector who uses it, as they’ll be better equipped to catch problems that may otherwise go undetected. A home inspector with a thermal imaging camera will take special pictures that will be included in your home inspection report along with detailed notes. The energy in the image shows up on a light-to-dark spectrum, with higher temperatures appearing yellow and lower temperatures appearing blue. For example, an orange spot on the wall may indicate an electrical hotspot that can pose a fire hazard. Using thermal imaging, inspectors can give the most comprehensive report regarding the status of your home. 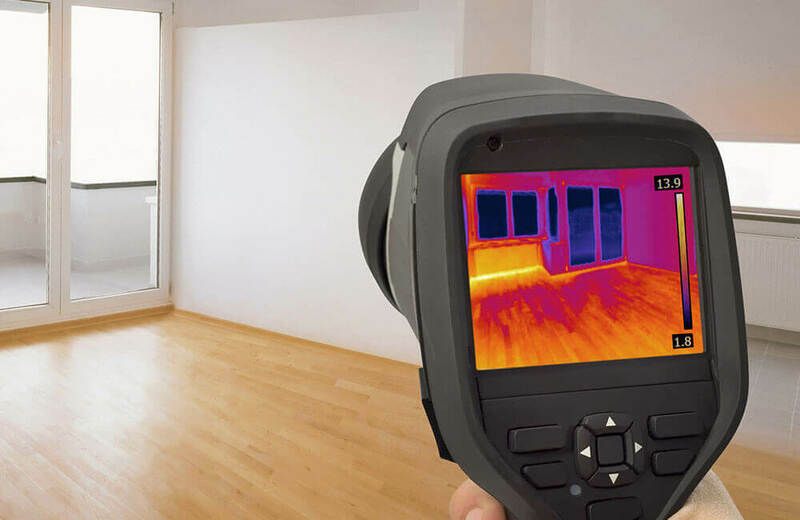 The three primary ways that thermal imaging helps in home inspections are by locating drafts and missing insulation, electrical hotspots, and moisture intrusion. Heat loss caused by missing insulation in the walls or attic or improper sealing around entrances like doors or windows causes your home to be less energy efficient. For example, in the winter, it may be harder to maintain a comfortable temperature because the warmer air is escaping the house, meaning greater output from your heating system. Thermal imaging is a great way of pinpointing problem areas where air or heat is escaping and what may be the causes behind them. Electrical hotspots are important to know about because they are a fire risk. Thermal imaging can be used to help locate areas where there is excessive heat, such as electrical panels or other areas where there is faulty electrical work. Since these electrical hotspots can’t be seen behind walls, thermal imaging comes in handy to either locate or ensure that your house is free of such risks. Excess moisture in the walls or ceiling that isn’t yet visible will damage the house for as long as it goes unnoticed. This can be caused by a variety of factors, such as plumbing leaks or a damaged roof or siding. With thermal imaging, moisture intrusion can be discovered by finding cooler spots around the house. If your house has mold, thermal imaging can also help by locating the source of the moisture. It is to your benefit to find a home inspection company who uses thermal imaging in home inspections. Ask if their reports include thermal imaging, or if it’s included in the price of the inspection or as an extra charge. Choose a home inspector who has the tools that help to provide an extraordinary inspection. Top 2 Bottom Home Inspections serves Nashville, Tennessee and the surrounding areas with home inspections that include thermal imaging at no extra cost. Contact us to book an appointment.